Has The Performance Of The S&P 500 Always Been So Top Heavy?Has The Performance Of The S&P 500 Always Been So Top Heavy? Has The Performance Of The S&P 500 Always Been So Top Heavy? 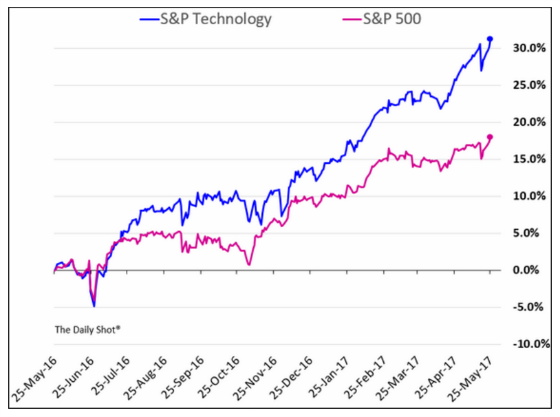 Technology stocks, particularly large capitalization ones, have been on a tear as the following chart shows. Since there is overlap between the two indices, I was curious to know how the largest technology companies have impacted the overall S&P 500 return. Facebook Technically there are only nine companies represented since two classes of Alphabet’s stock are counted. I want to focus on the technology companies for this analysis. These are Apple, Microsoft, Amazon, Facebook, and Alphabet (formerly Google). Assuming the weights haven’t changed over the last six months which I know is not accurate but a good working assumption for this analysis, let’s see how these companies did compared to the rest of the index. If we take their weighting times their six-month return then we can come up with the weighted return for these five companies. Combined, these companies represent 12.84% of the S&P 500. They have produced a weighted return of 3.57% during the past six months or 36.8% of the index return. The other 495 stocks have produced a weighted return of 6.03%, or 1.2% on average. In some ways, the S&P 500 is a form of momentum investing in which more money is added to the better-performing stocks and moved away from the weaker performers. The larger the company, the greater the weight, and the more index funds need to buy of it to keep adhering to the index weights. Strength begets strength. The iShares Edge MSCI USA Momentum Factor is a momentum-oriented ETF. Its approach is to buy what is working and weed out those stocks that are not. So what percentage of the ETF is invested in the five securities listed above? Remember their combined S&P 500 weighting is 12.84%. As of the latest reporting, the fund’s allocation to those five companies was 21.30%. Its allocation was approximately 70% higher than their S&P 500 weighting. The following chart shows how these five companies have been generating significant and growing excess return since the beginning of the year. 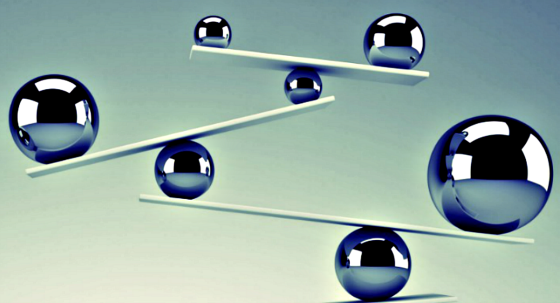 Has the performance of the S&P 500 always been so top heavy? One way of measuring this is to compare to the return from the equally weighted S&P 500 ETF (RSP) which has an approximate allocation of 0.2% of every company in the index to the S&P 500 which is capitalization weighted. The following table shows the returns during different time frames. What’s clear from the table is that something changed over the last two years which shifted the trend from S&P 500 underperformance relative to the equally-weighted index to outperformance. Let’s look at the five tech titans and see how they have performed over the last two years. Assuming the weights have not changed over the past two years which I know is not accurate but still probably not materially off from reality, then these five companies have produced approximately 58% of the S&P 500 return over the past two years. Clearly, a top heavy, momentum based strategy has paid off. 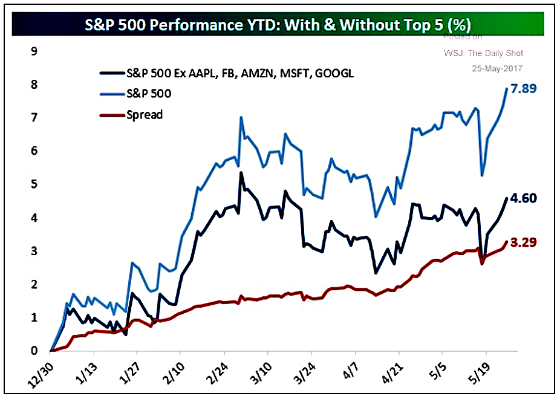 It’s interesting to see how Apple has only tracked the S&P 500 during the last two years. Given that it has significantly outperformed it over the past six months, then this means it underperformed the index for the 18 months prior to that. 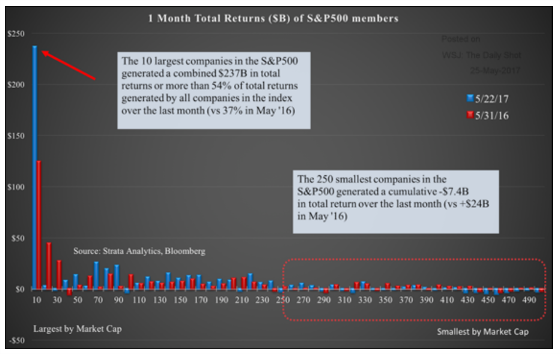 I will leave you with one more interesting chart showing how the 10 largest companies have produced more than 50% of the return over the last month. Given how large these companies are, I don’t see a major change in the weightings even if they have significant pullbacks. It would seem like investors have some pretty heavy exposure to these companies influencing the index going forward. 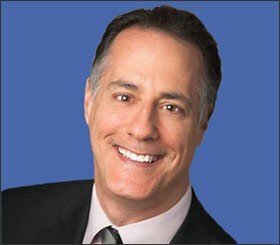 If they pull back or stagnate, the weights of the other companies aren’t meaningful enough to make a big difference in the returns. It might make sense to have more exposure to an equally weighted index if you think these companies may underperform. Will there be a future pullback or will the S&P 500 remain top heavy?